If you’re thinking about getting into online quoting, the numbers say that now is the best time to do it. 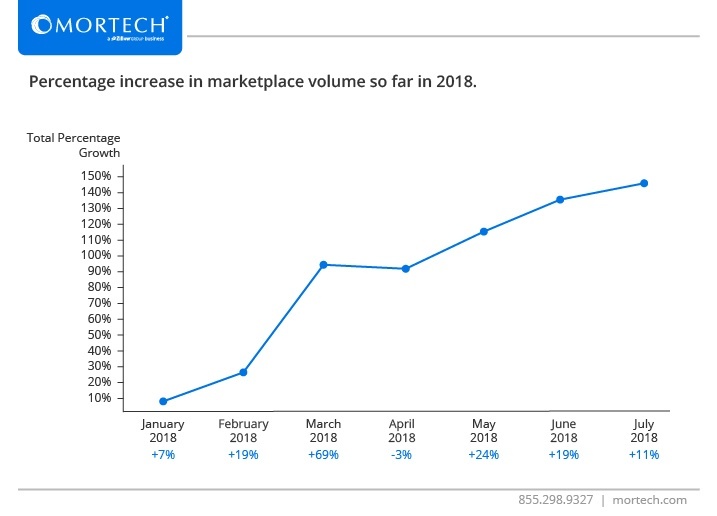 Since the start of the year, online rate marketplace volume has risen nearly 150%, hitting its highest point, so far, in July. Why is volume going up? Lenders have more options than ever when it comes to marketplaces, and finding the right marketplace to post rates has become key to finding success in online quoting. There are smaller, niche marketplaces like Credit Karma and NerdWallet that can be much more beneficial to a lender than throwing all of their rates onto the marketplace with the most traffic. By identifying where your rates should be, you can strategize and identify the best rate marketplaces to post them, and make your rates more competitive than they otherwise would be. No matter where you identify as the best marketplace to put your rates, Mortech can put them there. Whether it’s Zillow or Lending Tree, Quinstreet or Credit Karma, Mortech can process your rates and post them to your desired online rate marketplace. Not sure where to start looking? Our customer success team has a wealth of mortgage experience, and can find the right place for you to advertise your rates so that they are as competitive as possible. Stop wasting time only quoting on the largest marketplaces against stiffer competition – talk with us at Mortech today about how you can start posting more competitive rates in the right place.